As you’ve learned, social psychology is the study of how people affect one another’s thoughts, feelings, and behaviors. We have discussed situational perspectives and social psychology’s emphasis on the ways in which a person’s environment, including culture and other social influences, affect behavior. In this section, we examine situational forces that have a strong influence on human behavior including social roles, social norms, and scripts. We discuss how humans use the social environment as a source of information, or cues, on how to behave. Situational influences on our behavior have important consequences, such as whether we will help a stranger in an emergency or how we would behave in an unfamiliar environment. One major social determinant of human behavior is our social roles. A social role is a pattern of behavior that is expected of a person in a given setting or group (Hare, 2003). Each one of us has several social roles. You may be, at the same time, a student, a parent, an aspiring teacher, a son or daughter, a spouse, and a lifeguard. How do these social roles influence your behavior? Social roles are defined by culturally shared knowledge. That is, nearly everyone in a given culture knows what behavior is expected of a person in a given role. For example, what is the social role for a student? 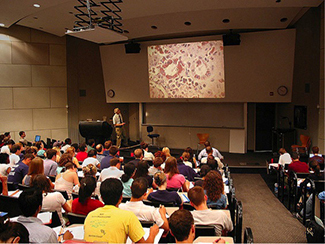 If you look around a college classroom you will likely see students engaging in studious behavior, taking notes, listening to the professor, reading the textbook, and sitting quietly at their desks ([link]). Of course you may see students deviating from the expected studious behavior such as texting on their phones or using Facebook on their laptops, but in all cases, the students that you observe are attending class—a part of the social role of students. Social roles, and our related behavior, can vary across different settings. How do you behave when you are engaging in the role of son or daughter and attending a family function? Now imagine how you behave when you are engaged in the role of employee at your workplace. It is very likely that your behavior will be different. Perhaps you are more relaxed and outgoing with your family, making jokes and doing silly things. But at your workplace you might speak more professionally, and although you may be friendly, you are also serious and focused on getting the work completed. These are examples of how our social roles influence and often dictate our behavior to the extent that identity and personality can vary with context (that is, in different social groups) (Malloy, Albright, Kenny, Agatstein & Winquist, 1997). As discussed previously, social roles are defined by a culture’s shared knowledge of what is expected behavior of an individual in a specific role. This shared knowledge comes from social norms. A social norm is a group’s expectation of what is appropriate and acceptable behavior for its members—how they are supposed to behave and think (Deutsch & Gerard, 1955; Berkowitz, 2004). How are we expected to act? What are we expected to talk about? What are we expected to wear? In our discussion of social roles we noted that colleges have social norms for students’ behavior in the role of student and workplaces have social norms for employees’ behaviors in the role of employee. Social norms are everywhere including in families, gangs, and on social media outlets. What are some social norms on Facebook? I tried a different tactic. I asked Jessica if having clothing from that particular store will make her popular. She replied, “No, it will not make me popular. It is what the popular kids wear. It will make me feel happier.” How can a label or name brand make someone feel happier? Think back to what you’ve learned about lifespan development. What is it about pre-teens and young teens that make them want to fit in ([link])? Does this change over time? Think back to your high school experience, or look around your college campus. What is the main name brand clothing you see? What messages do we get from the media about how to fit in? Because of social roles, people tend to know what behavior is expected of them in specific, familiar settings. A script is a person’s knowledge about the sequence of events expected in a specific setting (Schank & Abelson, 1977). How do you act on the first day of school, when you walk into an elevator, or are at a restaurant? For example, at a restaurant in the United States, if we want the server’s attention, we try to make eye contact. In Brazil, you would make the sound “psst” to get the server’s attention. You can see the cultural differences in scripts. To an American, saying “psst” to a server might seem rude, yet to a Brazilian, trying to make eye contact might not seem an effective strategy. Scripts are important sources of information to guide behavior in given situations. Can you imagine being in an unfamiliar situation and not having a script for how to behave? This could be uncomfortable and confusing. How could you find out about social norms in an unfamiliar culture? The famous Stanford prison experiment, conducted by social psychologist Philip Zimbardo and his colleagues at Stanford University, demonstrated the power of social roles, social norms, and scripts. In the summer of 1971, an advertisement was placed in a California newspaper asking for male volunteers to participate in a study about the psychological effects of prison life. More than 70 men volunteered, and these volunteers then underwent psychological testing to eliminate candidates who had underlying psychiatric issues, medical issues, or a history of crime or drug abuse. The pool of volunteers was whittled down to 24 healthy male college students. Each student was paid $15 per day and was randomly assigned to play the role of either a prisoner or a guard in the study. Based on what you have learned about research methods, why is it important that participants were randomly assigned? A mock prison was constructed in the basement of the psychology building at Stanford. Participants assigned to play the role of prisoners were “arrested” at their homes by Palo Alto police officers, booked at a police station, and subsequently taken to the mock prison. The experiment was scheduled to run for several weeks. To the surprise of the researchers, both the “prisoners” and “guards” assumed their roles with zeal. In fact, on day 2, some of the prisoners revolted, and the guards quelled the rebellion by threatening the prisoners with night sticks. In a relatively short time, the guards came to harass the prisoners in an increasingly sadistic manner, through a complete lack of privacy, lack of basic comforts such as mattresses to sleep on, and through degrading chores and late-night counts. The Stanford prison experiment demonstrated the power of social roles, norms, and scripts in affecting human behavior. The guards and prisoners enacted their social roles by engaging in behaviors appropriate to the roles: The guards gave orders and the prisoners followed orders. Social norms require guards to be authoritarian and prisoners to be submissive. When prisoners rebelled, they violated these social norms, which led to upheaval. The specific acts engaged by the guards and the prisoners derived from scripts. For example, guards degraded the prisoners by forcing them do push-ups and by removing all privacy. Prisoners rebelled by throwing pillows and trashing their cells. Some prisoners became so immersed in their roles that they exhibited symptoms of mental breakdown; however, according to Zimbardo, none of the participants suffered long term harm (Alexander, 2001). The Stanford Prison Experiment has some parallels with the abuse of prisoners of war by U.S. Army troops and CIA personnel at the Abu Ghraib prison in 2003 and 2004. 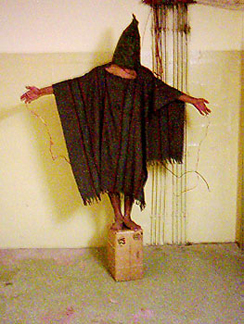 The offenses at Abu Ghraib were documented by photographs of the abuse, some taken by the abusers themselves ([link]). Visit this website to hear an NPR interview with Philip Zimbardo where he discusses the parallels between the Stanford prison experiment and the Abu Ghraib prison in Iraq. Human behavior is largely influenced by our social roles, norms, and scripts. In order to know how to act in a given situation, we have shared cultural knowledge of how to behave depending on our role in society. Social norms dictate the behavior that is appropriate or inappropriate for each role. Each social role has scripts that help humans learn the sequence of appropriate behaviors in a given setting. The famous Stanford prison experiment is an example of how the power of the situation can dictate the social roles, norms, and scripts we follow in a given situation, even if this behavior is contrary to our typical behavior. Try attending a religious service very different from your own and see how you feel and behave without knowing the appropriate script. Or, try attending an important, personal event that you have never attended before, such as a bar mitzvah (a coming-of-age ritual in Jewish culture), a quinceañera (in some Latin American cultures a party is given to a girl who is turning 15 years old), a wedding, a funeral, or a sporting event new to you, such as horse racing or bull riding. Observe and record your feelings and behaviors in this unfamiliar setting for which you lack the appropriate script. Do you silently observe the action, or do you ask another person for help interpreting the behaviors of people at the event? Describe in what ways your behavior would change if you were to attend a similar event in the future? Self-presentation by OpenStaxCollege is licensed under a Creative Commons Attribution 4.0 International License, except where otherwise noted.